Most likely you have seen the news clips…a soldier returns from combat to his surprised family as you reach for the tissues. 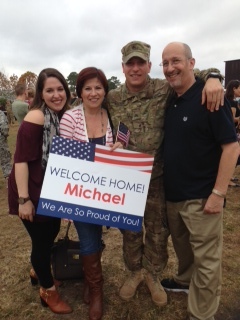 Let me share what is like when hundreds of soldiers return to their families when the element of surprise is removed. The Army band plays as the large screen projects images of the soldiers while they were away and the picture the soldiers received of their families back home. Homemade welcome home posters can be seen in the stands and little children wearing My Dad is Home t-shirts run around Veterans handing out flags. Months of anticipation and worry brought us all to this day. In the crowd, moms hold babies born after deployment and toddlers too little to know let alone remember their deployed parent. If parenting is tough with two parents, how difficult is it when one parent is unreachable and in combat? But what the families have been through is nothing compared to what these soldiers have been through. Then the greatest sound in the world…the siren of police escorts as the buses arrive. The soldiers march in formation as the band plays. The Chaplin says a prayer of gratitude for their safe return; the commander thanks the soldiers for their service in what could be the shortest speech in history. The families are waiting for his closing statement which is…find your soldier! The best pictures are the ones not taken because we are all so focused on the joy of the moment that no one cares about taking pictures. And you realize the only gift that matters is a hug. So much to be thankful for!